Blue and purple kitchens? Really? Yes, we cater for a range of styles and tastes here at 3Style Kitchens and the use of colour on your kitchen cabinets not only looks visually stunning but still allows you to add colour elsewhere without overwhelming the space. The Pendle range, elsewhere the confine of the traditional style, suddenly becomes much more modern in pastel and aubergine shades. Tone with other blues or add high contrast with red to create something unique and powerful. Definitely one for those wishing to transpose their bold and lively personality onto their interior design! 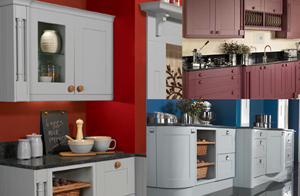 You can browse these Blue & Purple kitchens in our Kitchens by Colour gallery. For help planning your kitchen why not book a consultation? 0 Responses to "A closer look at our Kitchens by Colour: Blue & Purple"